Four times over the past three decades, an intimate group of French and American winemaking masters have come together to divulge in the tradition, expertise and secrecy of all-things-Chardonnay. Gathering in Meursault, the quaint village in the heart of France’s Burgundy region, 14 of the world’s finest Chardonnay producers traveled near and far to join the culmination of “Focus on Chardonnay.” The highly regarded event paid homage to decades of convention and camaraderie as the art of Old World and New World winemaking united once again. A tradition since 1986, the invitation-only event takes place at a different winery each year, where French and California winemakers participate in various meetings, seminars and activities focused on issues that impact the winemaking industry, from climate change to vineyard terroir and from production methods to winemaking culture. As it has for all previous Focus on Chardonnay events, Sonoma-Cutrer, known for producing world-class, handcrafted Chardonnay in the esteemed Russian River Valley of Sonoma County, was the ‘guest host’ of the finale reunion. The events took place at Domaine Matrot, one of the oldest estate-bottled wine producers in Burgundy, with seven other French winemakers and six California winemakers in attendance. Sonoma-Cutrer has played an important role at each Focus on Chardonnay reunion, as it is one of the few California wine producers to practice both Old World and New World winemaking methods. Chardonnay is a resilient grape varietal grown in many regions around the world; Old World Chardonnay refers to wines that are typically produced in the classic grape-growing regions of Europe (France, Italy, Spain, Germany, etc.) and employ meticulous, time honored and terroir-focused production techniques. New World wines are produced virtually everywhere else, often employing innovative vineyard and winemaking practices with a fruit-forward lens. A leader in premium California winemaking, Sonoma-Cutrer’s commitment to ‘Grand Cru’ methods of traditional Burgundian winemaking are paired with California innovation to provide a perspective that is unique among the world’s acclaimed wineries. This year, Sonoma-Cutrer Winemaking Director Mick Schroeter focused on the brand’s acclaimed Les Pierres Vineyard, its bold movement into screwcap testing and closures, and a special tasting of three of its library wines. The most highly anticipated portion of the Focus on Chardonnay event was the time capsule wine tasting. After 15 years locked in a temperature-controlled vault at Sonoma-Cutrer, the group of winemakers tasted the collection of storied 2000 vintages, rediscovering a past era of Chardonnay. The aging wine labels and closures told a story of time, both in visual and liquid form. Sonoma-Cutrer’s V’00 Les Pierres Chardonnay offered surprisingly delightful lemon and lime aromas balanced with the vineyard’s classic minerality, bright acidity, creamy mouthfeel and vibrant citrus fruits on the palate. Events concluded with a celebratory dinner, where guests tasted various Chardonnay offerings alongside exquisite French dishes, shared personal stories, and above all, enjoyed one another’s company. Harvest is always a crucial step in the winemaking process and we all anxiously wait for exactly the right moment when the decision is made to begin. Generally speaking, our harvest here on the Sonoma Coast occurs in late August to early October When the time comes, we will be out in each individual block of our six vineyards analyzing and tasting the fruit. We closely monitor the brix and pH levels of the grapes and taste to ensure the flavor will be just right. As soon as we have identified that a vineyard block has reached its peak of ripeness, we send word to our harvest crew that it is time to begin picking. Because cooler temperatures help our grapes to retain the highest concentration of flavor, harvest starts in the middle of the night and continues through the early morning hours. Most of Sonoma-Cutrer’s grapes are handpicked and placed in special bins created just for us. They are unusually shallow ensuring that the clusters are not crushed under their own weight and are delivered to the winery in pristine condition. Still touched only once, the cool fruit travels to the sorting tables where the clusters are hand – not machine – sorted. This is a highly, labor-intensive step in the process but it ensures that only the grapes of the highest quality make it to the press. Once the grapes fill the press, it slowly and gently crushes them helping us avoid extracting bitter tannins. The cool, golden-free run juice from the press is sent to tanks where it is allowed to settle for 24 hours. After racking, yeast is then added to the tanks before the juice is sent to French oak barrels to complete the fermentation and maturation of the wine. Harvest is one of the hardest, most exhausting parts of our entire year, but it also one of the most exciting and rewarding. For over thirty years, Sonoma-Cutrer has been dedicated to the pursuit of excellence in our wines, specifically Chardonnays. Behind this almost singular focus is a story about serendipity, place and the pursuit of perfection. In the early 1970s, after sampling a particularly memorable Bordeaux at an auction in Paris, Sonoma-Cutrer’s founder returned to America with a mission: to produce a wine that was Old World in its quality and elegance, yet thoroughly California in its expression. This pursuit ultimately would help usher in an era of world-class California Chardonnays. First, however, he had to find the right setting. At the time, vineyard property was expensive in Sonoma Valley, where Cabernet grapes reigned supreme. Planted on the only piece of affordable property he could find (part of which was rock quarry), the first year’s Cabernet vines failed spectacularly, falling prey to the foggy, cool microclimate. Though disastrous for Cabernet, the climate, the founder would soon discover, was a perfect match for Chardonnay, making Sonoma-Cutrer one of the earliest producers of Chardonnay fruit in the Russian River Valley. An admirer of the rigorous craftsmanship that defined Old World methods of winemaking and realizing that grape growing was a much more complicated undertaking than he had initially imagined, the founder decided focus only on a single varietal until he reached what he considered to be perfection. What began as a strategic decision to focus on Chardonnay gradually consolidated into an unwavering commitment to and ongoing love affair with the often underestimated varietal. Known as the ubiquitous grape because it’s relatively easy to grow (it’s the #1 most produced grape in the world), California Chardonnay, though vastly produced, has not historically been a particularly diverse wine, with most flavor profiles fulfilling the ‘bold, buttery, oaky’ stereotype. From our earliest days, however, Sonoma-Cutrer’s Old World winemaking techniques and our Grand Cru philosophy to winemaking- combined with the microclimates of our vineyards have enabled us to present a different view of Chardonnay to the world, revealing the world’s most commonplace grape to be capable of surprising range and nuance. Sonoma County is comprised of luxury resorts, fine restaurants, major highways, small towns, pastures, country inns, back roads, as well as, the ubiquitous idyllic vineyards. All of this is just over the Golden Gate Bridge, a short 45 miles from San Francisco. The number one grape varietal that you will find planted in Sonoma County is Chardonnay. Within Sonoma County is the Russian River Valley. 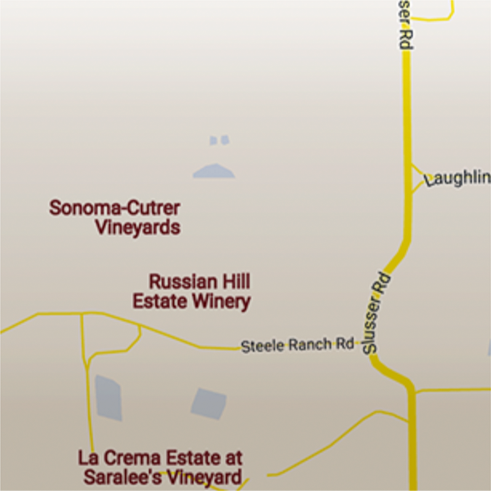 What in the world can Russians have to do with California wine country you ask? Well, the Russians were the first non-natives to settle in Sonoma County at Fort Ross from 1812 to 1841. They are credited for the first vineyard plantings in Sonoma County, but the type of grapes they planted is not known. Official status of the Russian River Valley as an American Viticulture Area came in 1983. The Russian River Valley has approximately 15,000 acres of vines planted within its 169,000 acres of land. There are over 200 grape growers and 70 wineries in this AVA fraction of Sonoma County. In general, it is considered to be one of the finest areas in California to grow grapes. Among wine aficionados, the Russian River Valley is one of the pinnacle for Pinot Noirs. The area is known for making rich and flavorful, world-class Pinot Noir. While Pinot Noir may garner the most attention, the number one planted grape, by over a thousand acres, is still Chardonnay. All other grape varieties in the Russian River Valley are significantly smaller in the number of planted acres. So, at the end of the day, one could say the Russian River Valley is all about Chardonnay and Pinot Noir. Why does the Russian River Valley grow great Chardonnay and Pinot Noir? One of the many reasons is the fog. Every day the fog is drawn in from the Pacific Ocean and can decrease the air temperature by as much as 40 degrees. This creates a cooler growing temperature that high quality Chardonnay and Pinot Noir grapes require and gives the wines a touch more natural acidity for balance and complexity. Try Sonoma-Cutrer’s single vineyard Chardonnay, The Cutrer, and their Russian River Valley Pinot Noir for two wines that exemplify the exceptional quality of fruit grown in the Russian River Valley. A Certified Wine Educator, Scott is one of 135 professionals in North America and 214 worldwide who have earned the title Master Sommelier. Since Sonoma-Cutrer’s establishment in 1981, only three select individuals have held the revered role of Sonoma-Cutrer’s Director of Winemaking: William Bonetti, Terry Adams and Michael “Mick” Schroeter. Sonoma-Cutrer’s winemakers must have the unique talent of balancing the art of winemaking with the science behind the crafting of our highly-acclaimed wines. Each of our winemakers are innovators in the field, pioneers who have not only established and sustained the uncompromising standards at Sonoma-Cutrer, but also influenced the wine industry at large. This year’s limited-production Winemaker’s Release held special meaning when we realized our unique opportunity to invite all three of these masters to collaborate on an exclusive offering. This year, Bonetti, Adams and Schroeter, have come together to craft the second in our Winemaker’s Release series aptly named Legacy. Every year, a handful of the very best barrels are set aside to create Sonoma-Cutrer’s Founders Reserve Chardonnay, our most distinctive Chardonnay. These three winemakers performed the honor of selecting the barrels to produce our most exclusive and historic vintage of this wine that has ever been crafted – Legacy. Founders Reserve Legacy is only the second wine to be produced in our Winemaker’s Release series. When the winemakers came together for their blending session, the mutual respect shared among them was palpable. As they progressed through selecting the wine, the winemakers tasted and weighed in, discussed adjustments and fine-tuned the blend. Just a few rounds later and all three winemakers set down their glasses and exchanged a knowing glance. Without a word, they knew they had reached a unanimous consensus – this is the one. We shouldn’t have been surprised by how seamless the collaboration was. After all, these craftsmen set the standards for Sonoma-Cutrer wines and defined the characteristics found in each of our Chardonnays. Founders Reserve Legacy is the culmination of nearly a century of collective winemaking expertise. Each bottle is infused with a shared devotion to the craft and enduring passion for Sonoma-Cutrer. Order a bottle of this limited-edition Winemaker’s Release today to own an exclusive piece of Sonoma-Cutrer’s history. California Chardonnay has traveled a storied journey through the decades, from The Judgment of Paris wine tasting in 1976, when a California Chardonnay beat out four French white Burgundies, to the heavy oak and butter-laden styles of the nineties that led to the unfair backlash dubbed ABC (Anything But Chardonnay). Throughout all of the fads, from butter bombs and big oak styles to crisp, fruit-forward unoaked varieties, Sonoma-Cutrer has stayed the course. Our unwavering vision has always been the same: produce the best Chardonnay possible by combining Old World craftsmanship with New World innovation. From the beginning, our terroir-driven Grand Cru approach has married traditional Burgundian winemaking methods with state-of-the-art technologies to produce elegantly structured Chardonnays that are deeply rooted in a sense of place. For one, it means that barrels used at Sonoma-Cutrer are made of fine French oak that we handpick from forests in the heart of France and then have crafted into barrels at generations-old family-owned cooperages in Burgundy. It also means that innovation has always been part of the equation. Take, for example, our cellar. Rather than digging into a hillside, we removed an entire hill in order to create the perfect cave-like conditions for aging, then reconstructed the hill around our 20,000-square-foot cellar. This meticulous approach infuses our wines with subtleties and nuance not always found in Chardonnay. In Sonoma-Cutrer’s early days, when many popular California Chardonnays were anything but complex, this refined style was rather revolutionary. Today, Chardonnay is finding its way back into the spotlight once again as more winemakers embrace food-friendly styles that balance fruit and oak, much like our own Chardonnays. And whether it’s a trend or more of a movement (though it certainly feels like the latter), the current emphasis on more elegant Chardonnay is one we embrace. No matter what the future holds for the world’s most popular grape, we’ll be right here making our Chardonnay the way we always have – in our own uniquely Grand Cru style. Join blogger WearyChef as she details her tour and tasting at the Sonoma-Cutrer winery! Along with long days, endless sunshine and ideal picnic conditions, the summer months offer a perfect opportunity to celebrate the region’s agricultural bounty. At the wineries, the grapes are plumping up under the summer sun in anticipation of the fall harvest. Patios and picnic tables countywide invite visitors to sip wine alfresco well into the balmy evenings. Stock up on picnic fixings at one of many local farmers markets that are in full swing throughout the summer. Browse bins brimming with just-picked fruits and vegetables as you enjoy live music, peruse handcrafted goods and snack on fresh-baked sweets. Want to get a closer look at where all of that gorgeous produce is coming from? Pick up a free map from the nonprofit Sonoma County Farm Trails and customize an agricultural adventure based on your interests. From family farm tours and fields of lavender to fresh-pressed olive oil and busy honeybees, you’ll be inspired by the county’s offerings. Do your cravings lean more toward cheese? Hop on the Sonoma Marin Cheese Trail to meet local cheesemakers, tour farms and, of course, get your fill of cheese tastings. You can even sign up for a class to learn how to make your own cheese. Wherever your Wine Country adventures take you this summer, be sure to stop by Sonoma-Cutrer. Enjoy a crisp glass of Chardonnay on the patio and soak up the sweeping views from the newly renovated tasting room. Festive events throughout the summer include Full Moon Croquet featuring food, wine and live entertainment. We look forward to seeing you in Sonoma this summer! This summer, Sonoma-Cutrer opened the doors to newly expanded tasting rooms where a variety of wine tasting experiences are now offered. Whether you’re a longtime Club Cutrer member or a casual visitor who’s new to Sonoma-Cutrer, you can customize your visit to suit your preferences. The breezy new space brings the picturesque Russian River Valley into the tasting room, with oversized café windows and doors that open onto the lovely terrace overlooking the pristine greens of the croquet court. At the heart of the tasting room stands an elegant island bar. Unique to Sonoma-Cutrer, the marble bar features cropped edges and a chevron pattern that pay homage to the winery’s logo. Belly up to the bar, grab a spot by the café windows or settle into an umbrella-shaded table on the terrace for a casual tasting that includes a game of croquet. You can also opt for a more in-depth guided tasting that features a flight of four wines. For a more personal experience, make a reservation online for a private hosted tasting in one of the intimate new tasting salons. For the first time, hosted tastings now include a Pinot-only option that showcases the winery’s award-winning Pinot Noirs. The cozy new salons are also an ideal place for a grand tasting of six of Sonoma-Cutrer’s most exclusive offerings. From limited production single vineyard wines to Founders Reserve offerings from the Winemaker’s Release series, you’ll sample Sonoma-Cutrer’s finest offerings. Want to extend your experience beyond the tasting room? Go behind-the-scenes at Sonoma-Cutrer with a tour that lets you walk among the prized vines and take a peek into the production area and barrel cellar. On weekends you can add a culinary element to your wine tasting with the Savor & Share Food Experience. Sample wine, cheese and small bites paired by celebrated Wine Country chef John Ash. Whether you’ve planned your trip around an in-depth tasting experience or wander in for a sip of Chardonnay, we look forward to sharing a glass with you in the heart of the Russian River Valley. Visit us and discover what makes Sonoma-Cutrer wines unique—and stick around for a quick game of croquet. This April, Zidanelia Arcidiacono (better known as “Z”) joined the Sonoma-Cutrer family as Assistant Winemaker of Pinot Noir. As fate would have it, it’s not the first time she has worked with Cara Morrison, Chardonnay Winemaker, and part of the Sonoma-Cutrer family since 2005. After gaining experience early in their careers by working harvests across the globe, a deeply rooted passion for wine led both women to Sonoma-Cutrer, where their paths first intersected in 2007. Cara hired Zidanelia as her first Harvest Enologist, a position she created to run a variety of experiments on everything from winemaking techniques to the materials used in processing. Not only was the job a valuable learning experience for Zidanelia, the women formed a professional bond that would last for years to come. Though Zidanelia had experience in wineries from Argentina to France, Cara was the first female winemaker that she ever worked with—a refreshing collaboration for both women. Zidanelia credits Cara with challenging her, helping her grow and giving her the tools she needed to be successful. When it came time to hire someone to head up Sonoma-Cutrer’s expanding Pinot Noir production, Cara immediately thought of Zidanelia. Her experience as Winemaker for Fetzer Reserve Wines and Little Black Dress made her a perfect candidate. The supportive professional relationship between these two talented winemakers speaks to the spirit of collaboration that defines the Sonoma-Cutrer family. Zidanelia has always been drawn to the winery’s team environment, where the lines aren’t drawn between Pinot Winemaker and Chardonnay Winemaker. At Sonoma-Cutrer, everyone is involved in each other’s projects—which elevates the end results every time. The benefit of this mutual trust and respect is, quite simply, better wine all around. Tired of serving the same dishes at every holiday gathering? Try some unique alternative dishes from Chef John Ash and serve a menu that will have your guests asking for more! Perfect for the Thanksgiving (or harvest) table, this seasonal soup showcases pumpkin along with another fall favorite – – wild mushrooms. Serve with a glass of the Sonoma-Cutrer Russian River Chardonnay. For the goat cheese, I especially like the Bucheret, Camellia or Crottin from Redwood Hill Farms (www.redwoodhillfarms.com) or the Humboldt fog or Bermuda Triangle from Cypress Grove (www.cypressgrovechevre.com). Serve with Sonoma-Cutrer Les Pierres Chardonnay. Dungeness Crab season begins in Northern California right around Thanksgiving, so we try to use it in as many ways as possible. This is a great dish from the past, and uses a classic egg yolk thickened sauce. It’s traditionally served on toast points but can also be spooned into little puff or choux pastry shells or in crepes. The mineral-ality of Sonoma-Cutrer Les Pierres would be a great match here. This brine works equally well with chicken or turkey. Brining is sort of a magical process that adds both flavor and moistness to the meat. In this recipe, I’m using a covered barbecue to both cook and smoke the birds. Be sure to use the indirect heat method described below in the barbecue and monitor both temperature of the barbecue and the birds with a thermometer. The objective is to cook the birds slowly enough, so that they can pick up a rich smoky flavor and you also want to be sure that they are cooked through. Enjoy a glass of Sonoma-Cutrer Pinot Noir while you are cooking. This is a simple cake that my grandmother used to make often. I’ve used apples, but any fruit such as peaches, pears, berries or a combination could be incorporated. If possible, serve with Sonoma-Cutrer Late Harvest Chardonnay. Temperature: Truth is that we often serve red wine too warm and white wine too cold. First reds – the old adage is to serve at room temperature.That’s all well and good but depending on where you live and the time of year, room temperatures can vary widely. When reds get too warm above 76 degrees or so the alcohol begins to volatilize or evaporate. This can do funny things to the flavor and aromas of wine and cause the wine to be unbalanced. Ideal serving temperature is in the 66 to 72 degree range. It’s perfectly acceptable to stick a red wine in the refrigerator for 15 minutes or so to get it to this temperature. For whites we often take them right out of the refrigerator which is somewhere in the neighborhood of 38 degrees. At this temperature the wine is completely “closed” and you can’t taste or smell very much at all. Unscrupulous restaurants will sometimes take advantage of this in their wines by the glass. If they’ve got a white that isn’t very good, they’ll serve it to you very cold so that you can’t taste how poor it is! Best to serve most whites in the 45 to 55-degree range so they flavors and aromas can emerge. This means take them out of the fridge at least 20 minutes or so before serving. Letting Red Wines “Breathe”: One of the oldest myths that still hangs on is that wine, reds especially should be opened ahead of time to let them “breathe” (it always conjured up for me little lungs in the bottle!). The reason given for this is that airing will help the wine to open up and develop flavor. If you think about it very little air is going to get to the wine through the narrow opening of the bottle neck. If you want the wine to “breathe”, the best way is to splash it into a glass and swirl it around vigorously as you enjoy it. The only exception is with old, fragile wines where opening too early can actually diminish the flavor. In recent years we’ve seen the development of a whole host of wine aerators built into pourers, spouts and more. The idea is that wine (either white or red) is improved by vigorous swirling, even more than you can do when poured in a glass. Turns out that this is in fact, true. Next time you open a bottle of wine, pour a glass and take the rest and actively splash it back and forth between a couple of decanters for at least a couple of minutes. Pour a glass of the “agitated” wine and compare it to the one straight from the bottle. I’ll bet you’ll prefer that which has been actively aerated. Decanting Red Wines: It’s a charming practice but unless you have some old trophy wines it’s not necessary. Most red wines made today have been filtered to remove sediments and, although there is a school that believes that this diminishes the flavor, most of us will rarely encounter a wine that needs decanting. If you do have a wine that is labeled “unfiltered” my advice is to stand the bottle upright and undisturbed for a day or two and then open it carefully making sure not to disturb the sediment on the bottom. You can then slowly and carefully pour it into a decanter or pitcher in one pouring until you begin to see sediment in the neck of the bottle. If the bottle is dark glass, do it over a lit candle or flashlight so that you can see the liquid. Stop at that point and if you’ve done it properly you should only have an ounce of so of cloudy wine left in the bottle. Choice of a wine glass: Most people know that it is traditional to serve different wines in different glasses – at least to the extent of having different styles of glasses for red wine, white wine, and champagne or other sparkling wines. But did you know that there are particular styles of glasses for Chardonnay or Cabernet? We’ve all been there: You’re out with friends or clients, the conversation is flowing and everyone is all smiles – until the bottle of wine arrives. And it’s presented … to you. Suddenly, the conversation has ground to a halt, and all eyes are on you. All you can think is – do I sniff, then swirl? How far am I supposed to stick my nose into that glass? And what am I supposed to do with this cork? It can be tempting to rush through the archaic seeming ritual, but don’t! According to our friend and Master Sommelier, Scott Harper, the whole point of all that pomp boils down to one simple but important question: Do you like the wine? Let’s back up a moment. First, you’ll want to confirm that the bottle is, in fact, the wine you ordered. This is a good time to make sure you’re not presented with a $400 reserve instead of that Sonoma-Cutrer Russian River Ranches Chardonnay you ordered. Next, you’ll probably be given the cork. No need to smell it – unless you want to, of course. Simply make sure it’s not crumbling, moldy or cracked, which may indicate a problem with the wine. Before you sip, go ahead and smell the wine. A little swirl will bring out the aromas, which are generally pleasant. However, if you get a nose full of wet dog or rotten eggs, the wine may be spoiled. Issues like cork taint and unbalanced sulfur levels are rare, but easy enough to spot. Assuming everything is sound, it’s time to taste the wine. Take your time – this is not a test. The point here is determining if the wine suits your palette. It’s also a good time to identify particular tastes that your sommelier may have mentioned. For example, in your Russian River Ranches, you might detect green apple, lime and pineapple, with touches of nougat and caramel. If something seems off, don’t be afraid to send the bottle back – or get a second opinion. And just remember that there is no wrong way to test out a bottle of wine. It’s simply about your enjoyment. Is there anything better than listening to live music under the stars on a warm evening with good company, a fine glass of wine and a belly full of fantastic eats? We think not. Enjoying a live performance at a lovely outdoor venue is an enduring summer tradition that’s best enjoyed when you’re permitted to pack your own food and wine. This summer, have a little fun filling your picnic basket by putting together a spread that complements the concert you’re going to see. Start by selecting a bottle of Sonoma-Cutrer wine that’s perfect for your particular event. Dusting off your cowboy boots for an evening of outlaw country or banjo-plucking bluegrass? These rootsy tunes are best enjoyed with good old comfort food and a creamy white that can handle all that flavor. Think: fried chicken, deviled eggs and potato salad topped off with a bottle of The Cutrer. This fuller-bodied Chardonnay maintains enough structure and acidity to make it a fantastic food wine. Gearing up for a little rock and roll? Stock your picnic basket with Sonoma-Cutrer’s Russian River Valley Pinot Noir. This bright, vibrant red features a slew of flavor notes that make it as complex and textured as really good rock and roll. As for the food, you can’t go wrong with a freshly roasted chicken and a big hunk of crusty bread accompanied by a selection of eclectic salads. Perhaps your evening involves a special night out to see the philharmonic in the park. Make an impression with a bottle of Les Pierres. Distinctive and elegant, this Chardonnay is crisp and rich with a mineral essence that reflects the rocky soil where the grapes are grown. Pair the bottle with cold crab cakes over spring mix salad topped with a citrusy dressing that will bring out the grapefruit and lime notes in the Les Pierres. No matter what type of music you’re planning to enjoy outdoors this summer, Sonoma-Cutrer has a wine to complement your concert. For picnic inspiration, find recipes and pairing suggestions here. A summer getaway is the perfect opportunity to linger over a fine glass of wine. A bottle that suits your destination makes the experience all the more enjoyable. Whether you’re gearing up for a trip that’s been on the books since January or you’re throwing together a last-minute escape, find inspiration in these three iconic destinations. Who doesn’t love a good beach trip? Bypass well-worn tourist favorites for a more civilized escape like North Carolina’s Outer Banks. With 200 miles of coastline along a string of barrier islands, there’s plenty of sand to go around. There’s also plenty to do beyond basking in the sun, from windsurfing and hang gliding to touring historic lighthouses and spotting wild horses. If you’re heading to your favorite beach this summer, bring along a bottle of Russian River Ranches Chardonnay to share. Crisp, light and refreshing, it’s a great match for lazy beach evenings – and pairs nicely with fresh seafood. Are the mountains more your speed? Opt for a rustic yet refined locale like Breckenridge, Colorado, where wine bars cozy up to outdoor outfitters along Main Street. The charming old mining town is also an ideal jumping-off point for hiking, mountain biking, horseback riding and fly-fishing. Top off a busy day in the backcountry by raising a glass to the 20-inch rainbow trout you hooked. A bottle of celebratory Les Pierres Chardonnay is an ideal pair for the fresh-caught fish thanks to its elegant balance and palette-cleansing acidity. If Wine Country is on your summer to-do list, skip the crowds in Napa for a stint in the Russian River Valley. The picturesque stomping grounds of Sonoma-Cutrer are a fine place to spend your getaway. Kayak the Russian River, unwind at a spa and, of course, tour some wineries. Start off at Sonoma-Cutrer for a crisp glass of Chardonnay and a round of croquet. There’s no better place to enjoy a bottle of The Cutrer Chardonnay than in this beautiful corner of California. Rich, creamy and fresh, The Cutrer is the perfect wine to toast a summer sunset, no matter where your travels take you. The season for dining alfresco is upon us, and farmers markets and gardens across the country are brimming with summer’s gorgeous bounty. Rather than planning yet another backyard barbecue this season, consider hosting an alfresco farm-to-table dinner party. At Sonoma-Cutrer, every culinary event from wine and cheese pairings to our elegant four-course meals start with local ingredients. What can’t be harvested from the on-site seasonal garden is procured from local food purveyors that produce everything from mushrooms to cheese with the same care and attention to detail that goes into making fine wine. Local ingredients aren’t just good for the environment and your local community: they simply taste better. There’s no comparison between produce that’s been harvested within the last 24 hours and fruits and vegetables that have spent the last two weeks traveling halfway around the world. Follow a few simple tips for a fun and easy foray into the popular locavore movement. Plan the menu around what’s fresh. If you have a garden, start there – even if your “garden” consists of a lone potted herb in your kitchen windowsill. Next, head to your local farmers markets and nearby farm stands to stock up and be inspired. Let the seasonal offerings be your guide, and get creative. The fun of hosting a farm-to-table meal is coming up with dishes that showcase the best of the season. When it comes to preparation, keep it simple and let the ingredients speak for themselves. Use uncomplicated cooking techniques to allow the vibrant aromas, textures and flavors to shine through. The same goes for any marinades or vinaigrettes you use – simple, simple, simple. Next, set the scene. Place a table alongside your garden where the produce was picked. Or, create a garden anywhere by dressing your table with fresh local flowers and herbs. Place foliage or candles in empty jam jars for an easy rustic charm. Finally, uncork a bottle of Sonoma-Cutrer to toast your successful venture into farm-to-table entertaining. Try The Cutrer Chardonnay for a creamy wine to complement crisp and earthy summer vegetables, or opt for Russian River Valley Pinot Noir to enhance hearty meats with juicy, dark fruit flavors. Most importantly, have fun! Let the season’s freshest offerings take center stage while you enjoy the company and savor the flavors found in your own backyard. The arrival of crisp sunny days, brilliant fall color and, of course, football signals a very important time of year for sports fans and the gastronomically inclined: tailgating season. Pre-game cuisine runs the gamut, from standard beer, brats and burgers to gourmet offerings that would make any food critic proud. The truth is, tailgating is a great opportunity to get creative, and Sonoma-Cutrer wines are the perfect pairing for an upscale spread. If you’re ready to step up your tailgating game, consider a global approach, treating your friends and fellow fans to exotic flavors they’ve never experienced in a parking lot before. While nothing says tailgate like firing up a grill, hot dogs and burgers can get old. Instead, look to Asia for a little inspiration. Uncork a bottle of Russian River Ranches Pinot Noir and throw some Korean-style short ribs on the grill. Watch heads turn as the aromas of garlic, ginger and soy sauce hit the air. Easy-to-eat chicken satay skewers served with peanut sauce and curry chicken wings are other ideas for grilling up delicious Asian flavors. If you’re short on time, look, to Latin America for flavorful finger foods you can pick up at your local farmers market or neighborhood takeout spot. Empanadas and tamales are ideal tailgating fare, and are filled with an array of savory and sweet flavor combinations. Serve your sports fans empanadas stuffed with pork, veal and pickled onions to braised beef or spicy chorizo tamales. If you planned ahead, add avocado fries, a popular street food South of the Border to your menu. Or, mix up a batch of scallop ceviche just before you leave, and it will be perfect by the time you park for the big game. Both make a lovely pair for a crisp glass of Russian River Ranches Chardonnay. To round out your moveable feast, opt for a convenient screw cap bottle of your favorite Sonoma-Cutrer served in tailgate-friendly plastic stemless glasses- Always be sure to pack plenty of extras – your impressive spread may attract new friends. The arrival of harvest time means an unofficial uptick in wine festivals happening around the country. These celebratory events offer a fantastic opportunity to taste a wide variety of wines in one place – not to mention hear live music, attend seminars and sample endless culinary temptations. Navigating it all can all be a little overwhelming. You don’t want to miss the good stuff, but how are you possibly supposed to taste all that wine – and keep your wits about you? First, do your research so you can plan your day(s) around any can’t-miss events. Find out which wineries will be there and hit your favorites first, before you max out on tastings. Once you’re there, pace yourself. It’s generally best to start with white and light and move on to red and full bodied so that none of the nuances are lost in the wake of heavier flavors. Opt for dry before sweet, as the long aftertaste of sweet wines may cause dry varieties to taste sour. For this reason, it’s not a bad idea to sample sweeter white wines after dryer reds. Drink water … a lot of water. In addition to cleansing your palette, drinking a glass of water for every glass of wine will help you avoid a dehydration headache. If you remember one thing, make it this: hydrate, hydrate, hydrate! Remember to eat plenty during the festivals. Take advantage of the local culinary offerings and snack liberally between tastings. Keep an eye out for artisan breads and cheeses (ask what pairs well with your latest taste) and palette cleansers like refreshing sorbet. Never be afraid to spit! That’s what those buckets are there for, after all. A swirl, sniff and quick wash over your taste buds are all you need to fully experience a wine. And the more you spit, the more you can sample. As with any event where you’ll be imbibing, assign a designated driver or a car service to make sure everyone gets home safely. Check out AllSheCooks blog on the various ways to enjoy Sonoma-Cutrer! Whether it’s fine dining with family or Holiday gift giving, Sonoma-Cutrer is the best choice. A full-bodied Chardonnay can stand up to the heartiest of fare thanks to the power it attains after resting in oak barrels—just like red wine! Chardonnay, in fact, pairs with a wide range of meats better than almost any other white wine because its relatively light acidity tends to complement whatever it’s paired with (rather than contrast), and its lack of bitter tannins makes it utterly versatile. Indeed, there’s a style for every meat, but which Chardonnay you choose depends more on the sauce with which you prepare and/or serve the meat. In general, it’s best to avoid highly acidic, super spicy, or super sweet sauces when pairing food with any classically dry wine. Here are our suggestions. White meats are both metaphorically and literally clean canvases upon which to draw flavor. Whether you sauté, grill or roast them, they remain ultimately lighter in body and flavor than, say, beef. Here’s an opportunity to pour a fruit-forward, medium-bodied Chardonnay that props up the lightness of the fare with juicy, mouthwatering flavors. Consider a wine like Sonoma-Cutrer’s Russian River Ranches. The intense fruit flavors and complexity of this Chardonnay makes this wine ideal for entertaining and versatile with food. Unlike any other meat, pork straddles the world of light and dark protein just like Chardonnay does of white and red wines; they each possess qualities of both. While the light meat from a loin of pork looks white, it certainly more flavorful and distinctive than, say, the white meat of a chicken breast. It can handle a more full-flavored wine. The darker, richer pork from the shoulder, then, demands even more power in a wine. Among white wines there’s only one that possesses both elegance and richness to match the pork: Chardonnay. In addition to classic apple and pear fruit aromas and flavors, look for Chardonnays perfumed with toasted nuts, spice, a hint of vanilla and a touch of butter. A wine like Sonoma-Cutrer. This wine has the signature. Sonoma-Cutrer’s Sonoma Coast Chardonnay is all of that, and more. Pairing Chardonnay with dark meats like steak and lamb depends, moreso than in any other case, on the overall preparation, and in particular, on the accompaniments. That aforementioned steak frites served with a medallion of butter on top usually comes with a side of creamy, buttery Béarnaise sauce, too. Grilled lamb chops or butterflied leg of lamb is often served with olive oil and a squeeze of lemon. The Chardonnay to pair with any of them needs to be powerful and rich enough to stand up to the protein’s bold flavor, and complement the various sides and sauces. This is where Sonoma-Cutrer Les Pierres Chardonnay come to the table, bringing with it the prestige of a veritable California ‘Grand Cru,’ brimming with complex aromas of lime, grapefruit and lemon mixed with the flinty, mineral notes that are a defining characteristic of superior Chardonnay. Caramelized oak, vanilla and spice nuances nicely balance the citrus flavors. A perfect match. The Big Game is Coming… to the Bay! The Big Game of 2016 is in San Francisco and Sonoma-Cutrer Winery is honored to be part of the festivities! Super Bowl City, a free fan village, will offer activities for locals and visitors alike to enjoy the extravaganza that is the sporting world’s biggest annual event. Inside Super Bowl City, Sonoma County, the Official Destination Partner, will host the Taste of Sonoma Lounge featuring the best of Sonoma County. As a Sonoma County Vintner’s Official Pouring Partner, Sonoma-Cutrer will be poured at the Taste of Sonoma Lounge! Visitors to the Lounge will taste our award-winning Chardonnay and Pinot Noir wines and visit with our talented winery team. Whether you plan to attend The Big Game or simply experience San Francisco during this incredible week, visit the Sonoma Lounge to taste the best of Sonoma County. A trip to the Bay Area would be incomplete without a taste of our world-renowned wines. We also invite you to visit us for a winery tour and tasting. Click here to reserve your selection. Hurry! The options during the Big Game week will book quickly! Show off your favorite team’s logo when you visit and receive a complimentary* tasting. *Offer good February 5-7, 2016. Reservation required. Contact winery for additional details. A great way to learn about wine is to stage a wine tasting party next time you and friends get together. I recommend concentrating on one varietal or type such as Chardonnay or Merlot so as not to confuse your palette. Have everyone bring a favorite bottle then put them in brown paper bags to cover the label and identify them only with a number or letter. It’s a good idea to limit the tasting to no more than 6 wines. Pour them out (you can usually rent extra wineglasses locally at a party supply store at a decent price). Use a grease pencil or small stick-on label to mark each glass with the corresponding letter or number so that you minimize any chance of confusion. Be sure to pour each glass no more than 1/3 full to allow each taster plenty of room to swirl and swish the wine to develop its aroma. Provide each taster with a simple score sheet so that they can individually note what they like about each wine then have them rank the wines in order of preference. Do this part quietly and individually and after everyone has finished their own ranking, have one of the group total them up. Once the group ranking is known, individually reveal each wine from the bottom to the top of the ranking, discussing them as you go along (be sure to have some plain French bread and maybe a simple cheese on hand to help clear the palette as you taste thru each wine). You’ll find it’s a lot of fun and a great way to discover new wines that you might not have tried before. Like food, preferences in wine are very individual so there really is no right or wrong answer (if you have a “wine geek” or “cork dork” or wine “expert” in your group, be sure to remind them of that before starting!). The one additional thing you can do to make the experience even more instructive is to have someone do a little research on the varietal that you’re tasting to briefly report on its history, geographic location, etc. Two of the very best resource books for this purpose are the Oxford Companion to Wine edited by Jancis Robinson and Karen MacNeil’s The Wine Bible. Both are available thru bookstores and of course on-line.They are wonderful references to have at home if you think you want to know more about wine. Many refer to Chef John Ash as the “Father of Wine Country Cuisine”. In 1980 he opened his namesake restaurant, John Ash & Company, in Santa Rosa, CA. It was the first restaurant in Northern California wine country to focus on local, seasonal ingredients in the quest to create dishes that complemented the wines being made in the region. Most of us know the feeling of staring blankly at an extensive wine list, lost somewhere between Chardonnay and Cabernet. Paralysis by analysis – what seems to be an easy decision can quickly turn into a daunting task. Will this wine overpower the entrée? Should I have ordered red instead of white? What if I don’t like the wine I order? Enter the sommelier, master of the vine, fluent in everything wine. If you think you know a lot about wine, sommeliers know more. The sole purpose of these dedicated professionals is to help you discover and enjoy wine as much as they do, finding the perfect complement to your meal. Yet sommeliers go largely untapped by many of us, who either forget that sommeliers are even an option or assume that our wine needs are not demanding enough or our knowledge extensive enough to justify calling in such an expert. While Master Sommelier and wine consultant, Scott Harper, concedes that sometimes people may have a level of insecurity in utilizing Sommelier services while out dining, it’s important to remember that sommeliers are there because they love helping people with wine. Most sommeliers train for years, perfecting their craft as they explore wine culture. Master Sommeliers (there are 135 of them in North America) are even able to identify a glass of wine down to the vineyard and vintage. In a restaurant, the sommelier is in charge of wine procurement, storage, cellar rotation and, most importantly, providing expert service to wine customers. Their main goal is to make you feel comfortable with any and all wine inquiries, not to show off their knowledge, which, rest assured, is immense. So go ahead, ask your sommelier to describe what “dry” actually means. Ask what flavors you’re tasting, which aromas you’re smelling. Ask why California Chardonnays taste different than other Chardonnays. You might just find out that the sommelier is the best-kept secret you forgot you knew. Every spring, the lively sounds of mallets clacking, glasses clinking and guests laughing signal the start of Sonoma-Cutrer’s Chardonnay and Croquet events. The popular annual tradition is held on the winery’s pristine croquet greens once a month through summer. The only winery in the world to boast professional quality croquet lawns, Sonoma-Cutrer plays host to the country’s best croquet players every year at The North American Open. And while the talent level at Chardonnay and Croquet may not be quite as impressive, the event offers plenty of spirited fun – along with fabulous Chardonnay. If you can’t make it out to Sonoma-Cutrer for croquet this season, consider hosting your own event. A fun change of pace from a backyard barbecue or traditional dinner party, the game is a great way to encourage your guests to interact, and a little competition can liven up any gathering. Croquet is, after all, a social sport. While it dates back to the thirteenth century, when French peasants knocked wooden balls through wickets made of willow branches, the game didn’t truly take off until the 1870s. Popularized in England, it was the first game that men and women could play together outside – generally in a lovely garden setting. Games should only take around 30 minutes, so you can easily host a little tourney. Between shots, keep the competitors fueled up with cheese, crackers, dried fruit and nuts. As for beverages, nothing compliments this warm-weather activity better than a nice, crisp white. We’re partial to Sonoma-Cutrer’s Russian River Ranches and Les Pierres Chardonnays, but any nice white will do. So break out the wickets, don your traditional whites (or don’t – as long as you’re comfortable) and uncork your favorite Chardonnay for a little alfresco fun. For the complete rules on setting up and playing your own croquet game, please click here. Before guests arrive, chill all of the wines. Then, wrap each bottle in a brown bag tied at the neck with string or aluminum foil. If you need to further chill the wines until guests arrive, you could put them in ice buckets, putting those in brown bags in a plastic bag first to keep it dry; those in foil will be fine in ice. Remove the capsule that covers the cork completely. With a marker write a number on each bottle, from one to six (or as many as you’re pouring). If you’re serving multiple bottles of the same wine for a large crowd, be sure they are numbered correctly. Then, on a spacious bar, table or countertop, set up six stations featuring a large, lined notepad and a pen. On each pad write “Wine No. 1,” “Wine No. 2,” etc. for the number of wines you’re serving. When you’re ready to serve the wines, place each bottle in front of its corresponding notepad. Without guests seeing, pull the corks and taste each bottle to make sure they aren’t corked (or taste off, like moldy cardboard). Don’t forget to hide the corks, because they often display the wine’s logo or other info that might give them away. Now, invite guests to taste the wines in any order, and then write their name on each notepad as they taste, along with their guess as to which type of wine they are drinking. Is it Chardonnay? Is it something else? Take a guess! While practically everyone knows Chardonnay, not everyone knows that it hails from the Burgundy region of France, where it’s known as Bourgogne Blanc, or white Burgundy. You will almost never see the word Chardonnay on a bottle of white Burgundy, but rather the region, village or vineyard name. While most white Burgundies are made in oak barrels that impart flavor to the wine, those from the Chablis region are unique, because most are made without oak interaction, vinified in stainless steel tanks. Chablis’ cool climate yields wines with high acidity and distinct “flinty” notes, and less of the apple-y fruit we often identify with traditional Chardonnay. This is as unadulterated as it gets. Many value-priced Chardonnays (under $15, let’s say) possess qualities that you’ve come to expect: buttery, toasty, creamy nuances, with a touch of vanilla and a kiss of citrus. They represent an overtly oaky style—often called “California Style”—that was popular 25 years ago, when America was just starting to fall in love with Chardonnay. Today, makers of high-quality California Chardonnay strive for balance, crafting fruity wines that are also lean and crisp. Ask your retailer for a Chardonnay that’s “minimally-oaked,” like Sonoma-Cutrer’s Sonoma Coast Chardonnay, whose creamy richness is balanced with bright, mouthwatering acidity and highlighted with flavors of apple, pear and lemon zest. The word Bordeaux is instantly recognized as one of France’s great wine regions, and for most Americans it also means a great red wine. However, Bordeaux is also known for its delicious, if not-well-known white wines, hiding in plain sight in your best wine shops. The grapes to know in this region are Sauvignon Blanc and Semillon, which are blended together—and you’ll never see their names on the label, only “Bordeaux Blanc,” or, if they are from a specific district, you’ll see that name, too. Ask your retailer for a Bordeaux Blanc from Graves, or, even better, from Pessac-Léognan, where the wines are made in oak barrels, but not with a heavy hand. You might be surprised by how much they remind you of that minimally-oaked Chardonnay in bottle No. 2. Cotes du Rhône is another one of those French wine names that immediately brings to mind red wine, but like all wine regions around the world, both red and white wine grapes are grown. In the case of the Rhône, there are many, many types of grapes grown, and a lot of them end up in the final blend of the wines, as is tradition in this part of France. By French law, in fact, white Cotes du Rhônes must contain a minimum blend of 80% Clairette, Grenache blanc, Marsanne, Roussanne, Bourboulenc and Viognier. Ugni blanc and Picpoul blanc may be used as secondary varieties. These wines possess fruity, citrusy qualities, coupled with a distinct richness that might trick some guests into thinking it’s a minimally-oaked Chardonnay, like the one in bottle No. 2. One of the grapes in bottle No. 4’s Cotes du Rhône Blanc is Viognier, which plays a supporting role throughout the Rhône Valley, but is the star in bottles labeled “Condrieu.” These tend to be very, very expensive—and very, very delicious, possessing honeysuckle aromas and flavors, and a distinct unctuousness that might remind some wine lovers of the richness of full-bodied, heavily-oaked Chardonnay. But you can also find far more affordable styles of Viognier from Australia, California and Washington. While its inherent lusciousness may remind tasters of Chardonnay, the giveaway that its not is its highly aromatic bouquet, often brimming with, in addition to honeysuckle, also pears, peaches, and even violet flowers. The employment of oak in the making of great Chardonnay goes back centuries. When applied judiciously, the wine takes on a richness and depth of flavor that would otherwise be impossible to achieve. The problem for the word oak in the context of Chardonnay is that as the grape (and wines made with it) grew ever-more popular over the past quarter-century, techniques to deliver oak-imparting character without actually using oak have grown, too. Which is why many value-priced Chards taste more or less the same. But, if you raise the bar, and invest in a world-class Chardonnay, you may fall in love with this style all over again. Ask your retailer for a “classically-oaked California Chardonnay,” something like Sonoma-Cutrer’s ‘Les Pierres’ from Sonoma County, a wine whose deep, complex aromas of lime, grapefruit and lemon mixed with the flinty, mineral notes that are a defining characteristic of Grand Cru Burgundy, is accented with hints of caramel, fresh cream, nutmeg and honey. Have you ever been driving home from work knowing that, in order to enjoy wine with dinner, you’ll have to make an extra stop at the local wine shop? While casually perusing the shelves is great when you aren’t in a hurry, it becomes a chore when you don’t have time to contemplate the enormous selection, or consider what will pair with dinner and match your guest’s preferences. Having a wine collection at home can alleviate this hassle and is wonderful for every wine aficionado. -Enjoying a bottle of wine at the drop of a hat, without a trip to the wine shop, is an accessible luxury. A wine collection does not have to- be 2,000 bottles; a nice wine selection can be 50 well-chosen bottles. To set up your home collection, you will need to consider a few select details. First, you need a place that will remain cool (50- to 60°F) and has good humidity (50- to 75°). There should be no direct light, vibrations or off odors. It is also important to have the ability to keep the bottles resting on their sides. Wines age best when they are kept at a constant temperature under these conditions. Any good collection will have multiple varietals and several bottles of the more popular wines like Chardonnay and Pinot Noir. Choose wines that are your favorites, pair well with food and you know your guests will enjoy. Two Sonoma-Cutrer wines that I suggest be a part of any home collection are the 2011 Les Pierres Chardonnay and the 2012 Russian River Valley Pinot Noir. Creating your own personal home collection is not only fun, but useful. Enjoy! The main objective of pairing -food and wine is pleasure. We should drink and eat what we like despite what any food or wine expert says is right or wrong. It is best to be open-minded enough to try different wines and foods. It is nice to try different varietals with the same foods. If you open multiple wines, open them at the same time and try each with your dish to see which you think pairs the best. Using flavor bridges sounds complicated, but it can be as simple as using the same or similar wine in a dish that you plan to serve. For example, use a Chardonnay in your white wine butter sauce and then serve the same Chardonnay with the dish. A medium-bodied to full-bodied, dry and crisp Chardonnay like Sonoma-Cutrer’s Sonoma Coast paired with a grilled sea-bass with a Chardonnay butter sauce creates a bridge and continuity of flavors. Serving wine that has similar flavors as your food dishes will help emphasize those flavors. Using flavor bridges is just one of the many ways to match food and wine. While there are exceptions to the above general guidelines, it will work more times than not. Remember to pair wine and foods of similar weight for best effect. By implementing a few, simple techniques, you will definitely enjoy a more exceptional experience than the boring red wine with red meat and white wine with white meat. Give it a try and see where it take you!